Book Contents Thanks for your responses What is Greatness? Sept 10, 2014 Michael Browns Tragedy: "America, Can You Hear Me?" Feb. 26, 2014 Ex Nihilo: Did God Create the World out of Nothing? Nov.19, 2012 What is Spirituality? Aug. 27, 2012 What Happens of Human Soul After Death? July 9, 2012 Prophecy of President Obama Comes True! June 25, 2012 Secret of Oprah Winfrey's Success Discovered! Steve Jobs: Meaning of His Last Words, "Oh Wow!" Father, "I pray that they may be one as we are one." Is your God bigger than my God? Will America survive the coming catastrophes? Weekly Words of Inspiration Inspiration "In Everything Give Thanks to God"
Hearing the Voice of God. Jesus said to me, "Deny yourself, take your cross, and follow me." My journey with Jesus started since I was a little kid, over 50 years ago. I have been hearing a mysterious Voice from within. About 12 years ago, this Voice amplified to a giant volume following my closest encounter with death. I was unaware that the voice I was hearing through the Holy Spirit was the voice of Our Savior Jesus Christ. At a point in this journey, Jesus revealed his physical appearance to me. Since then, I have received many visitations from the Lord with many instructions. He anointed me as a messenger. My most important mission is to serve his purpose. I do believe there are many people around the world specially chosen and specially positioned to serve the Lord's purpose. However, people tend to allow egos, human desires and emotions to get in the way. I have never experienced anything more humbling in my life. The most powerful of his visitations happened during the time of painful crises. This book is the chronicle of my journey with Jesus regarding where he leads me, the instructions he gives me, and the messages he asks me to deliver to the nations. In a way, I do not want people to believe my story after hearing about it. I did not believe when events were happening around me and visions were being revealed to me either. I kept them a secret for a while. However, I want people to read the accounts of my ongoing journey from this book. Afterwards, they can then make up their minds. I am sure there are many events in my story that will touch their hearts and set on fire the Holy Spirit within. This story reveals some of the mysteries of Our God, his nature, and the invisible world of his holiness. 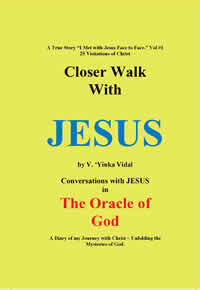 In this book, you will learn more about the character of Our Lord Jesus, and how he guides his messengers to serve his divine purpose. I am one of those humble and undesirable witnesses. Closer Walk With Thee is a perfect book for anyone working in the ministry to serve the Lord. If you read this book, you will learn to hear His voice. I also believe, your life as a Christian will change forever. Release Date: Summer 2011, published by Lara Publications Inc. St. Louis, MO. 472 pages, 314-653-0467. Fax 314-653-6543. A search for personal fulfillment eventually leads to a life of tragic failures. That's why Jesus said, "Deny yourself take your cross and follow me." This is the story of Lisa Anderson, (not her real name) the wife of a wealthy man in Chicago suburb in her battle with breast cancer. 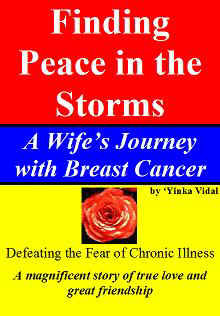 This book is a rare look into the journey of a woman with her closest friend, and her husband when she is afflicted. The greatest battle she has to fight is not the cancer, or the disease as much as her FEARS that invade her soul. Instead of surrendering to her fears, Lisa learns to confront and fight those fears one by one, until she becomes triumphant over each of them setting her soul free. In the end, she lives a very enjoyable life even when facing the odds of her illness. What Lisa Anderson did for her husband to show her love will blow the mind of any wife who claims to love her husband. "Mark Oppenheimer, Oprah Winfrey is Not a Cult Leader!" Who Murdered the Son of God? Correcting Oprah And Eckhart Tolle: There is Nothing Called "Christ Consciousness"
Why Blame Rob Bell, the author of Heaven, Hell, Love Wins? Should Christians Blame President Obama? Day #2 America What Went Wrong? God is Angry! Day #6 Is Yoga Bad For You? To promote the gospel of the kingdom of Jesus Christ and the work of those laboring to serve his purpose.